Can't afford to buy a house? 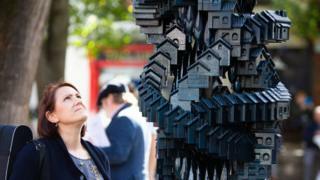 Perhaps you'll be able to afford to buy one of the 400 miniature empty homes in a new sculpture that has been made as a comment on the UK's housing market. Matthew Plummer Fernandez's 3m (10ft) artwork was made with a 3D printer. It has been unveiled as part of the first York Mediale digital arts festival, and was inspired by the artist's own struggles to buy a home. The 36-year-old Londoner is planning to put each of his 400 units up for sale. Anyone who buys one will own a share of the sculpture, and the prices will be pegged to the house prices in the place where it eventually ends up. Plummer Fernandez wants his artistic housing block, titled Token Homes, to be seen as a comment on the way many homes are built and bought firstly as investments, rather than to live in. "Housing units and flats become nothing more than a vehicle for investing money and generating a return, or having that as the savings account," he says. "And that value tends to equate to the value of where they're situated. "So I wanted to create a housing estate where the housing function is removed. No-one actually lives in these homes - they're just financial vessels, they're just these little units that you can buy and sell." Plummer Fernandez had the idea for the sculpture after scrolling through property websites, he says. "I'm definitely generation rent. Buying a property is extremely difficult and unfathomably expensive. "And when you look into it, you realise a lot of it is fuelled by property market speculation, and that a lot of the schemes that are being built are not for us, not for residents. "I live in London and you see buildings going up everywhere, but a lot of them are aimed at overseas investors, and a lot of these houses remain empty. "They're just there as financial devices, rather than homes. I've had moments when I've tried to buy a house and then just found it impossible." In 1995-96, 65% of middle-income 25 to 34-year-olds owned a home, but just 27% did in 2015-16, with the biggest drop in south-east England, according to the Institute for Fiscal Studies. Meanwhile, the number of households in the private rented sector in England rose by 80% in the decade after 2006/07, government statistics show. House price calculator: where can I afford to live? Plummer Fernandez hasn't put the sculpture's 400 miniature homes on the market yet and their price will depend on the artwork's eventual permanent home. "I wish York would adopt it," he says. "That would be great. But there are no plans to fix it there yet." Anyone who eventually buys one will become a co-owner of the sculpture. Artworks, like houses, are often bought as investments. "There's a direct parallel there and I'm playing a little bit with that as well," Plummer Fernandez says, adding that art is "another form of parking money". The sculpture was 3D-printed by North Yorkshire-based Stage One after Plummer Fernandez spent a six-month residency with the architectural design company. It has been placed in Kings Square for the duration of York Mediale, which opened on Thursday and runs until 6 October. The festival was created following York's designation as a Unesco City of Media Arts in 2014.